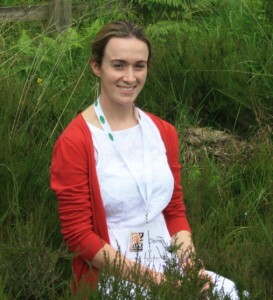 The Irish Peatland Conservation Council are pleased to announce the appointment of Miss Claire Sullivan in the role of Visitor Guide at the Bog of Allen Nature Centre. Claire is a native of Killina, Carbury. Co. Kildare and is a keen sportswoman who represents her club at county level as a member of the Kildare Senior Ladies LGFA team. She is also an honours science graduate of Institute of Technology, Carlow where she specialised in forensic science and analytical chemistry. Claire is turning her attention to wildlife and bogs this summer as she joins the IPCC team as our visitor guide. “After just two weeks at the centre I have met people from America, Canada, Spain, Germany and Ireland who really want to learn about Irish heritage and culture and to actually see a bog in the flesh” says Claire. Claire will be meeting and greeting visitors and guiding them through the peatland exhibition centre, Lodge Bog and wildlife gardens. She will also be working with the local community to develop an Atlas of the Natural, Cultural and Economic resources in Lullymore Bog. Claire holds a B.Sc. degree in Anaytical and Forensic science from the Institute of Technlogy, Carlow, and a B.Sc. Honours degree in Environmental Science, also from the Institute. During her studies, she was familiarised with all aspects of the environment, in particular environmental management and modelling and also undertook a freshwater ecology module and completed various field trips and sampling techniques in natural habitats. All of this work will be put to practical use with the IPCC. Apart from science and environmental awareness, Claire is a keen sports person and is the current captain of Carbury Senior Ladies LGFA and proudly holds many awards and achievements within the club. She also represents her club at county level as a member of the Kildare Senior Ladies LGFA team. “I am delighted to be working at the Bog of Allen Nature Centre and I hope to achieve a much better understanding of peatlands and the science behind our unique boglands”, she added. The Bog of Allen Nature Centre is open to the public Monday- Friday from 10am – 4pm. If you have a group that would like to visit the centre for a guided tour, contact Claire and make a booking today on 045-860133 or feel free to drop by to the centre for some information on the environment. This entry was posted in News and tagged Attraction, Family Nature Activities, visitor. Bookmark the permalink.